Cockroaches - Chameleon Food Par Excellence! For many years I fed my insect-eating reptiles just about like everyone else did. In those days we mainly fed mealworms and the occasional wild bug got mixed into the equation when the chance arrived. It took me quite a while before the light finally went off in my dimwitted head and I realized that varied high quality nutrition was not only a main pillar that provided health to my animals but was also going to become a passion of mine that endures to this day! Since those early days I have discovered what many take for granted today and that is without a varied and nutritious diet captive chameleons and other insect-eating herps just don't live that long in captivity. We have come a long way in a few short years when it comes to learning and teaching others what to feed their animals. Commercial insectaries have sprung up all over the place and we are now favored with such delicacies as domestic crickets, silkworms, giant zoophobias, house flies and their larvae to name but a few. Even with what is currently being offered we still fall very short on variety of food for our animals. Besides the obvious nutritional benefits of offering a varied course of feeder insects another often forgotten benefit, which seems to get lost is that variety, even to a reptile, is the spice of life! The keeper hardly ever considers a lizard as a thinking organism that has psychological needs that go beyond nutrition alone. If you have never offered your chameleon anything but the regular brown cricket and the ubiquitous regular or giant mealworm you will most likely be quite surprised when you offer a luscious wild caught green grasshopper, katydid or praying mantis to your lackluster animal! The offering of such fare usually results in a much happier animal that almost seems to smile after getting such a morsel! The psychological and nutritional benefits are unequivocal and I have seen animals that acted depressed and morose come to life and run across a room to get at a wild caught black cricket or dragonfly. A few years ago a friend that kept and bred Chameleons, frogs and other insect eating animals introduced me to what has quickly become my most favorite feeder insect group in many ways, this being the often amazing and wonderful family of Cockroaches! 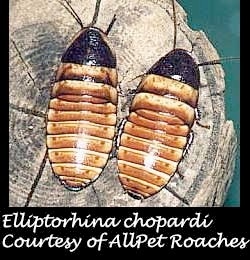 Cockroaches offer many benefits other domestically raised insects do not! Roaches come in many sizes and shapes and can magically transform a lackluster animal into a feeding machine when they are presented one! Yeah I know, you've heard that Cockroaches carry all sorts of diseases and invade homes and can't be gotten rid of once they escape etc... etc. For the most part this is all untrue and anyone raising the right species will quickly tell you that the escaped common domestic cricket can be far more troublesome than a well-bred roach ever is! I am not going to kid you, it is true, if roaches are not housed carefully they can escape and will sometimes become established in your house if conditions are right but really this is the exception and certainly not the rule! I have had roaches escape on numerous occasions in my house and after a short time they just disappear because the living conditions for the species I keep are not right for them to survive for long. If you choose species mentioned later in this article you should be pretty safe from the chance that you will ever have a plague of these insects loose in your home. As far as roaches carrying disease goes, nothing could be further from the truth! The fact is that no known human disease has ever been traced back to a roach despite all the contrary information you might have heard or read in the past! Roaches are among some of the cleanest of insects and most cannot live where conditions are filthy or unhealthy for humans. There are a few species that are pests and can live in really disgusting places but these are not really what we are discussing here. What is a good roach to raise then? There are literally hundreds of species of roaches worldwide but for our purposes I would suggest we deal with the two top runners for the position of "Best roach as a feeder insect". In my opinion the two best roaches that can be easily raised as feeder insects are the Little Brown Cuban Roach, Nauphoeta cinerea and the Dwarf Madagascar Hissing Roach, Elliptorhina chopardi. 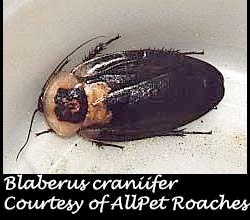 If I had to choose a third type it most likely would be the True Death Head Roach, Blaberus craniifer. All of these can be comfortably handled in a collection and when eventually bred to large numbers offer the easiest feeder insect imaginable to raise. The Little Brown Cuban Roaches (Nauphoeta cinerea) are my all time favorites because they do not grow too large, do not have unpleasant odors like many roaches do and are like little living hamburgers full of wonderful juicy meat for your animals to consume. Makes my mouth water just thinking about them! The Dwarf Madagascar Hissing Cockroach (Elliptorhina chopardi) is a good feeder for larger species and its young are also little fat packed morsels! The much larger form of Madagascar Hisser is, in my way of thinking, just to large to use unless your wanting the smaller stages for feeders. 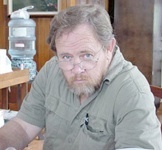 Anyone that is even somewhat remotely interested in learning about all the other types should go to "Roachman Willis" and his incredible Cockroach site at http://www.angelfire.com/wy/roaches/index.html. Richie is probably the worlds leading expert on captive roaches and maintains a collection second only to God! But be careful! Roaches can be very addicting and really are amazing things to study and keep! Another very good source for information and an excellent identification guide is at http://www.angelfire.com/oh2/Roaches/. You can purchase starter colonies from Ritchie or others on the web or perhaps you might poke around and find a friend hiding the fact that he actually raises roaches but is afraid to admit it! Roaches can be kept in just about any container you would keep a cricket in. I have successfully kept them in glass aquariums, plastic sweater boxes and other plastic tubs and even large metal cans. The main difference between keeping roaches and crickets is that Roaches (at least some types) can climb the smoothest of surfaces if they are at all dirty or have not been buffed to a complete shine. A simple barrier can be either stuck on or painted on the upper inner edge of a container and this usually will stop any roach from gaining freedom. I have used the brown shiny packing tape that's plastic and sticky on one side as a barrier for things such as the Madagascar Hissers and they can't cross it even as small hatchlings, which are the main ones, that climb anyway. Other roaches can climb over this tape and it depends on the structure of their legs whether they are climbers or not. The Cinereous Roach rarely climbs and usually only if disturbed in some way but it's always prudent to make a barrier for this species anyway. I use petroleum jelly (Vaseline) and put a barrier around the upper edge about two-inches wide and down from the edge a few inches depending on what container I have chosen to keep them in and how deep it is. This barrier needs to be replenished from time to time depending on humidity and heat. You will get the hang of it after watching to see if your bugs can get past it or not. Usually once a month I check every box and make sure the barrier is intact. Deathhead roaches do not climb and can be kept in any semi slippery surfaced container with safety and without a top. It's a good idea to keep a tight top on your roaches if for several reasons a top keeps things like spiders and other predators out. Just make sure they have good ventilation. There is nothing more distracting then to find your kids have dumped the roach colony on the floor and are now using the box for a toy. A top is always good insurance! Roaches eat literally anything that doesn't eat them first! You can offer virtually anything you eat and then some. I like to feed the Madagascar Hissers mainly leaves from Alder, Elm and Maple as this gives them a more natural food that they would eat in nature but they also will eat dog food, vegetables, fruits and all other foods that do not have insecticides on them. Just remember that what you feed your roaches will be passed onto your animals when feeding them. Give as wide a diet as possible and cover all the bases and you will give your lizards a much more rounded diet then you ever could by offering them just mealworms and crickets! Actually there is a ton more that I could write here but the basics are pretty much what they are for crickets from here on out. Roaches either give birth to live young from retained eggs inside the female or lay little capsules that contain several babies when they hatch. They do not need any special container for this especially when you provide the Coco peat substrate. Roaches can live in multi-aged colonies in complete accord. They rarely eat each other and the worst thing you might find is that they may eat each other's wings if too crowded or not given enough moisture to drink or stressed in other ways. The ideal temp to keep your roaches at is around 80°F. They will breed and live at lower temps but don't do as well in my experience. Higher temperatures are not necessary and only make the colony age faster. Believe it or not roaches are quite slow to get a colony started so get as many founders for your colony as you can to start with. The more breeders the more eggs will be laid. I usually find I cannot harvest roaches of any size from a colony till it's at least six months old if not closer to a year. Once the colonies are sizeable you need to split them up because sooner or later the colony will all of a sudden explode and overnight the roaches can produce a toxic gas possibly C02, that will kill virtually the entire colony if your not careful. This especially happens in too damp, too hot or too closed a box. I know of a colony of Death head roaches that are well aired and are literally a foot deep with millions of roaches per colony. 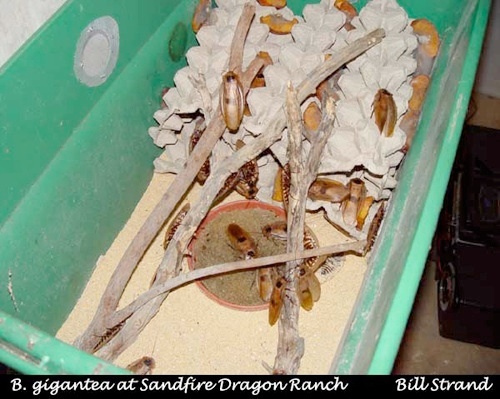 Each day the breeder harvests five gallon buckets of roaches out to feed his huge collection of lizards. 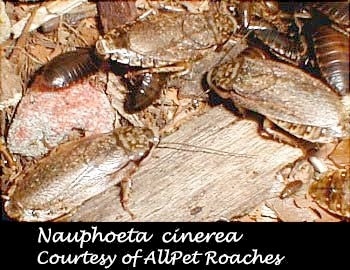 The roaches are fed on table and grocery store scraps only and breed literally...well, like roaches! You will discover that once your colonies are going well that you will have insects of many different sizes, textures and appearances. This is the wonderful thing about raising roaches you can now pick through your colonies and offer your various lizards the exact item they want. Raising roaches is so easy and interesting that it's hard to believe more folks don't do it! Try these insects and I bet you'll wonder how you ever kept animals without them! While I feel roaches are the ideal feeder insect group they do have a couple of faults. The biggest problem with feeding roaches to something like a chameleon is the fact they like to hide as soon as they are placed in a cage. This necessitates either putting the roaches in an escape proof container that the chameleon can get to or hand feeding the roach, which isn't really much of a problem for people that don't have many animals to feed at one time. Even adult Madagascar Hissing Roaches will grow too large to feed most animals. The smaller growth stages are great however! Hopefully I have covered all the basics here. If you have any questions feel free to send me an email and I'll try to fill in anything I omitted above.